Peter Paul Rubens’ The Fall of the Damned is as good an argument to not sin as any. Standing at 9.38 feet by 7.35 feet, this piece is also a ginormous reason to not sin. You can see in really big, excruciating detail how the whole you-going-to-hell thing is going to go. It’s not pretty. In fact, it’s highly horrifying. This piece was inspired by the quote from the Bible, “Depart from me, ye cursed, into the eternal fire that is prepared for the devil and his angels." There is no Jesus or Virgin Mary in the painting, just the fires of hell and a ton of other sinners. Fat sinners. Skinny sinners. Tall sinners. Short sinners. The devil really doesn’t discriminate. We know Rubens was a fan of big ladies though, so there are definitely more of those than anything. Our personal favorite is the woman just southwest of the center of the painting who is being held on the back of a devil with its tail wrapped around her legs. Her face says that she’d rather not be there, but she knows what she did to get there and it wasn’t not worth it. Get it girl. Unfortunately, this painting was attacked with acid in 1959 and though it was restored, the vandalism all but destroyed the piece. Apparently the content of the painting did nothing to deter an attacker from trying to ruin it, which is surprising based on how incredibly over the top and frightening the piece is. I mean, seriously, if you stopped to look at this piece for even a second, it should force you into a serious reevaluation of your life and decision-making habits. There are several drawing of this piece in existence, which hints at the fact that Rubens may have planned to make an engraving of the piece like he did with a lot of his favorite works. But if this engraving was made, it’s probably in some old lady’s attic collecting dust. 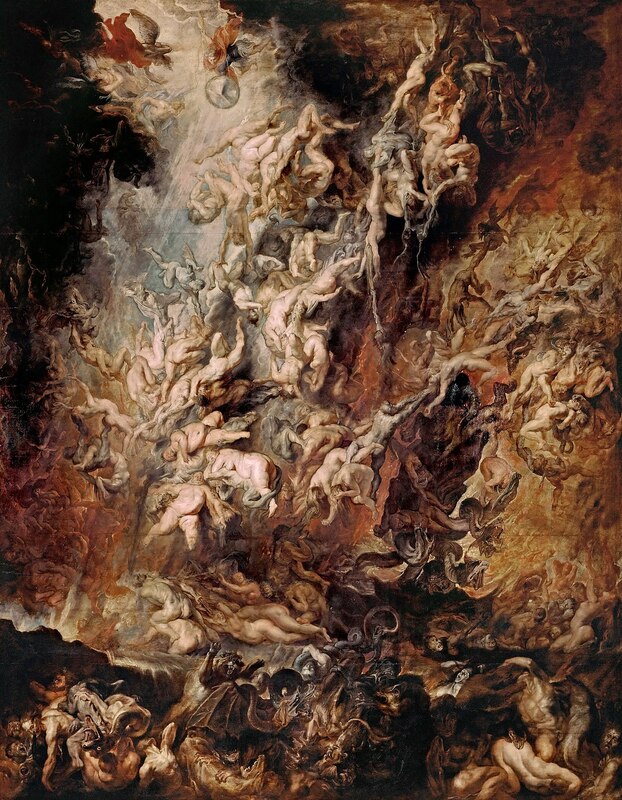 The Fall of the Damned, alternately known as The Fall of the Rebel Angels is a monumental religious painting by Peter Paul Rubens. It features a jumble of the bodies of the damned, hurled into abyss by archangel Michael and accompanying angels. David Freedberg assessed this painting manner as the "most brilliant assemblages of lusciously naked flesh in Western art". In 1959, an art vandal threw an acid on the painting. According to him, he did not directly destroy the work, but the acid "relieves one from the work of destruction". Check out the full Wikipedia article about The Fall of the Damned.